This weekend we went to Barnes and Noble. I had a couple of gift cards and an afternoon spent wandering around a book store sounded peaceful. Remind me never to go to Barnes and Noble on the weekend again. It was crazy getting there and it was crazy once we were there. So many people, and I am not a people person. Despite that, we had a nice time. The kids each found something they wanted and my husband kindly donated his gift card to me. What a nice man. I got this. 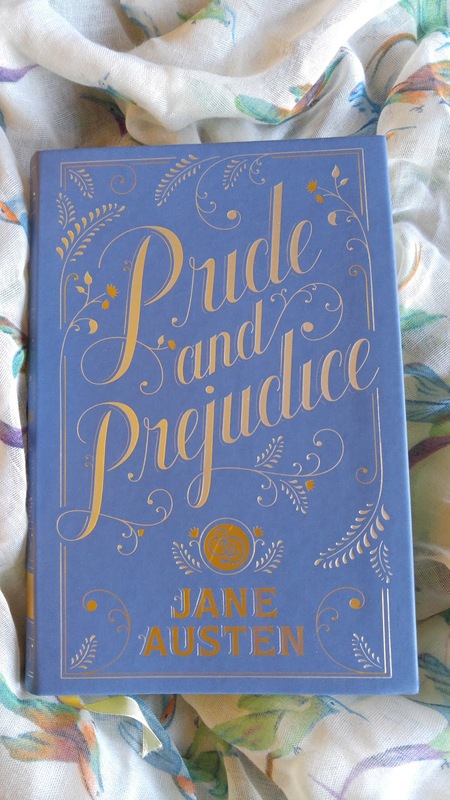 I need another copy of Pride and Prejudice like I need a hole in my head but it is just so pretty. I picked it up and I was lost right away. I carried it around and kept telling myself I was going to put it back but somehow I was still holding it as we walked up to pay. I am now madly rushing through all the books I have going so I can sit back and luxuriate in reading a pretty copy of one of my favorite books. Buying books because they are attractive has never been my thing so I am not sure what came over me but I am just going to go with it. I also bought All Our Worldly Goods by Irene Nemirovsky. I recently read Suite Francaise and enjoyed her writing style. 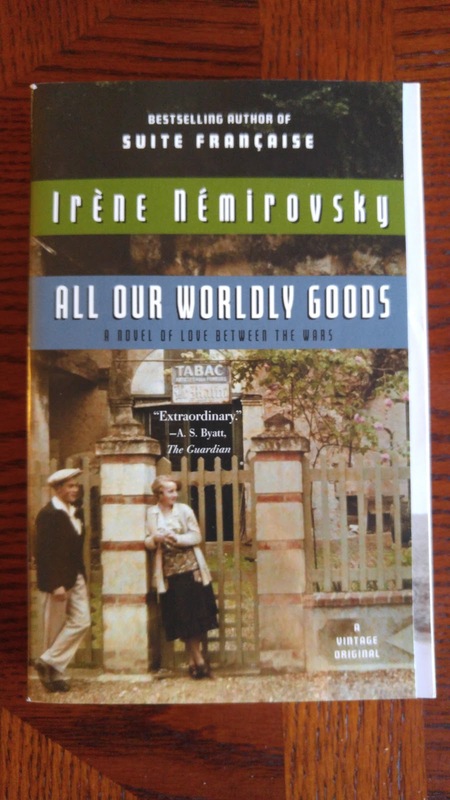 This is described as "a novel of love between the wars" which makes it sound sort of corny. I am sure it isn't, but I wish they hadn't used that line. Why are so many books described in the same way in the blurbs on the back? This one is also haunting, elegant, and poignant. It is possibly all true, but the words are used for so many books that they start to lose their meaning. That being said, prepare for a review in a little while in which I tell you the novel was about love between the wars and it is haunting, elegant, and poignant. Don't say I didn't warn you. This week I started watching Home Fires. It was on PBS not that long ago. I recorded it and never got around to watching it, I don't know why. A show about England during WWII is right up my street. So far I am enjoying it. I think I want to live in a little English village and wear 1940s clothes, just without the war. I also bought suitcases this week. I know, that doesn't sound wildly exciting. However, they are really a gift from my parents since they gave us some money for our anniversary. Plus, they are for our trip to London in April since the ones we had got pretty much destroyed on our last flight. Anything that makes London seem closer makes me happy. I have a list of book stores as long as my arm and I am trying to narrow it down to the essentials. Maybe I should locate coffee shops nearby for my husband. He likes book stores but not quite as obsessively as me. He does, however, like coffee to an obsessive degree. I am also trying to decide what else we want to do since it won't be all book stores all week. We have been before so the main touristy things have been done. I think there are some National Trust properties in London that we can tour. I like touring houses and gardens and seeing how people used to live. I am sure this won't be the last time I mention London on here. I talk about it a lot. If I am shopping with my daughter and stop to look at something, a purse or some shoes or whatever, she will look at it carefully and then pronounce judgement on whether or not she thinks it will be good for my trip. I have trained her well! It has been a rainy and miserable day but I made cinnamon bread and it is just about ready to come out of the oven. The smell is wonderful. It is the little things that brighten up a dreary day. The smell of cinnamon bread, a pretty book, and plans for a trip. Life isn't half bad. I'm so envious of your upcoming trip! This year will be a milestone birthday for me, and I'm thinking of taking a trip to celebrate. England would be on the top of my list. I have two copies of Pride & Prejudice myself :) Both Penguins - not as pretty as your new copy. England is always a good idea! You should go for it, then when my trip is done I can live vicariously through any posts you do about your trip. Have you been before? It is like coming alive inside of your favorite books. Everywhere you turn you see something familiar that you have read about. This copy of Pride & Prejudice is SO pretty, I wouldn't be able to resist it either! The only problem is that now I want the rest of Jane Austen's books to match this one. So unnecessary but so pretty. That cover of Pride and Prejudice is so, so beautiful. Who's the publisher? There is only one book that I have two copies of and that is A Little Princess. I read it so often my old copy is yellow and battered. So when Puffin released A Little Princess in their gorgeous Puffin in Bloom collection, I just had to have it. I think it's okay to make double purchases for well-loved titled, but perhaps I am just trying to search for ways to justify my extravagance. It is a Barnes and Noble collectible edition. It is pretty, isn't it? My daughter loves A Little Princess. I like it too, but The Secret Garden is the one I read over and over when I was little. I am always more than happy to justify the extravagance of buying a beautiful copy of a beloved title! I am so envious of your opportunity to live in London for a while. That is my dream but I don't think it is ever going to come true. And yes, if there are any places you think I shouldn't miss be sure to tell me. If you like Indian food but can't stand the bustle of Brick Lane, the lamb biryani in Memories of India (located in Gloucester Road) is just divine. My father has always turned up his nose at Indian food and even he was converted! Another Gloucester road favorite, Da Mario restaurant for some delectable Italian (apparently Princess Diana loved to visit). Despite the royal connection, prices are relatively sane. My roommate and I used to live off the bread basket. In fact, order their CESTINO DI PANE ALL'AGLIO O SENZA. It sounds mad to pay for warm bread with olive oil but it is SO, SO good! If you want to splurge for some nice steak, Hawksmoor is excellent. I went to their Knightsbridge restaurant but I think they have other locations in London. Always, always order their Sunday roast. It is the best value for best quality AND quantity. At twenty pounds you get a portion for two starving men. Seriously, I eat like a pig and even I couldn't finish everything on my plate. The duck fat roast potatoes is like manna from heaven. The carrots were so sweet we ordered an extra portion. And the beef was excellent as well. Thank you for the recommendations. They all sound wonderful.